Hercules! Spider-Man! Ares! New Avengers! Wolverine! Mighty Avengers! The Agents of Atlas! If theres a bigger event this fall, we dont know what it could be! At long last, the Prince of Power takes the fight to his villainous stepmother Hera and the forces of the Olympus Group -- just as she unleashes the most terrifying threat the Marvel Universe has ever seen! But first Herc has to gather together a star-studded strike force from the ranks of the New and the Mighty Avengers! First on the list: THE AMAZING SPIDER-MAN! But why is Everyones Friendly Neighborhood fighting against Hercules? Has he joined the side of the dark gods? 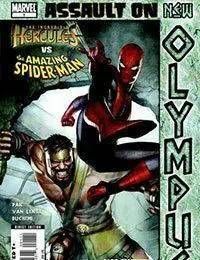 Its webs and wisecracks versus Olympian power in this super-sized one-shot! (There will be major property damage, we guarantee.) Plus: The iHerc team proudly welcomes our new INCREDIBLE HERCULES on-going back-up feature... THE AGENTS OF ATLAS, written by fan favorite scribe Jeff Parker! When the forces of New Olympus target Venus, will Jimmy Woo lead his team into the fray for or against Hercules forces.